The atmosphere and setting were perfect — the glow of candlelight in St Helen’s Church, stunningly decked with flowers for a wedding the following day as the Pastores Ensemble delighted a packed audience with their eclectic mix of medieval and renaissance music. Robert Carrington, one of the founders of the ensemble in 1991, explained a little about its background, choice of repertoire and range of instruments. One of their earliest concerts in 1991 was actually the last time the group performed at St Helen’s Church. At that time the line-up consisted of only recorders and viols but over the years, with changes in membership of the group, the range of instruments now boasts lute, mandolin, ‘ recorders, cornemuse (a wind instrument), — guitar and treble, tenor and bass viols. Robert explained that viols are not related to violins — they are in fact bowed fretted instruments related to early guitars. 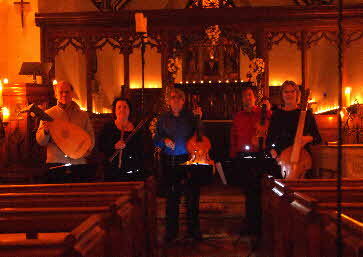 This broad range of instruments allows them to extend their repertoire across medieval, renaissance, baroque music and beyond such that they now play music from the time of Henry VIII and Elizabeth I in Britain to Louis XIV in France and also some contemporary pieces composed by Robert himself and some 20th century composers. The audience at St Helen’s were privileged to witness the premiere of ‘In Nomine for John Cage’, a piece written by Robert to celebrate the centenary of American composer, music theorist, writer, and artist John Cage. During the interval, mulled wine and traditional ginger wine with mince pies were served, a fitting repast for this enchanting festive occasion. The mammoth sum of £477 was raised on the night, thanks to the talent and generosity of the Pastores Ensemble. The group’s next concert is their own, entitled ‘Music for a Medieval Church’, to be held at St Nicolas’ Church, Old Shoreham on Thursday 11 April 2013. You can keep up with their news (and hear some music) on these websites: pastoresensemble.org.uk; carringtoncomposer.org.uk.